The design model integration with Onshape now supports material properties. When parts are imported, Altair SimSolid now checks the Onshape material name. If the name is identical to a Altair SimSolid material name, the Altair SimSolid material properties will be assigned. Note that the Onshape density values are not used. All material property values are from the Altair SimSolid material database. This provides a convenient way to assign and manage material properties in Onshape documents. Now geometry updates will retain the CAD based material property definitions. Reassignment of materials is no longer required. To add and assign Altair SimSolid material names with Onshape, perform the following steps. Click your name in the top right corner of the Onshape window and select My account. Select the Preferences tab on the left, then scroll to the bottom of the page on the right until you see Material Libraries. Select the Add material library button then select “Altair SimSolid materials” from the public Onshape document “Altair SimSolid material library”. The new material library will now be added to the list on the Preferences page and is now available through the standard Onshape Material library dialog. Now, simply use this library to assign materials to your parts. Inside of any Onshape document, select one or more parts. Pick with the right mouse button and select the Add material menu item. 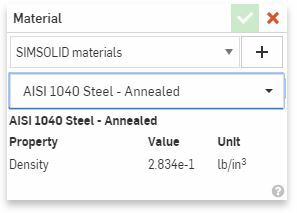 Select the Altair SimSolid material library as the source, pick a material name and then the green checkbox button. Now when you import your model into Altair SimSolid, the assigned material property name will automatically link to the corresponding Altair SimSolid material. Manual material assignment is no longer required and material references will be retained when the geometry is updated. Note that this works with both the desktop and cloud versions of Altair SimSolid. User defined material properties are also supported. Just make sure the material name matches between the Onshape and Altair SimSolid material libraries.